If the rumors are true, this phone, like many of its Android brethren, is sizing up. According to a leaked log file obtained by MyCE, it will sport a 5-inch display, and a 441 PPI, full HD display. That's a definite upgrade from the Nexus 4's 4.7-inch 320 PPI screen. We first got a peek what we think is the 5 in the hands of some Google employees at the unveiling of Android 4.4 Kit Kat, and every leak we've seen since has been in line with that look—thin body, bigger screen, horizontal Nexus logo, and a bigger camera lens. What may be the best look yet can be seen in the top photo, a slim-ish black phone with a big build found by a MacRumors forums user. Update: This is a hands on with the alleged Nexus 5. It basically confirms everything we already think we know about the new smartphone's design and features. Update 2: In case you had any doubt about what the Nexus 5 looked like, here are some new images that popped up on the Android subreddit by way of a kid whose dad apparently works for Google. Once again, these images are consistent with pretty much every leak we've already seen. Update 3: Another day, another Nexus leak. These appear to be press images of the Nexus 5 from Canadian carrier. And surprise! It looks like everything else we've already seen. Update 4: Just in case you had any doubt, here's a purported—albeit crappy—picture of the Nexus 5 that surfaced on Reddit. Can you believe it? 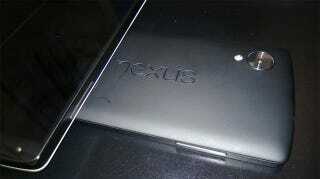 This rumored Nexus 5 looks like a rumored Nexus 5. Between regulatory documents from the the FCC's approval last month, some leaked logs, and what seems to be the Nexus 5's service manual, we have what we think is some solid intel on the Nexus 5's internals. Apparently, we're looking at 2.3GHz Snapdragon 800 chip, and 2GB RAM. Qualcomm's mighty quad-core chip—the same one the LG G2 runs on—is just about the fastest processor you can get in a phone right now. Snapdragon 800 has one of those, low-power bonus cores that can do stuff while the rest of the phone is sleeping, like the M7 in the iPhone 5s, or the voice core that lets the Moto X do all its "Ok, Google Now" magic. But in spite of allegedly having the same processor as the G2, the Nexus 5 could be a Hercules without any of the brain damage. Last year, we found that the Nexus 4 was the Optimus G with the edges smoothed out, and it looks like we might see the second verse of the same song very soon when the new Nexus arrives. Interestingly enough, rumors suggest the new Nexus won't get a camera upgrade, which, if true, is a downright shame considering how horrid the Nexus 4's camera is. In fact, in our tests, the Nexus 4's camera was terrible even under the best of conditions. With the 5, we'll reportedly be stuck with the same 8MP rear camera, and get a slightly downgraded 1.2MP lens on the front. Disappointing, but you have to keep the price low somehow. Also, the new Nexus will apparently come with bigger storage options; 16GB, 32GB, and 64GB this time around, rather than just 8 and 16GB. The FCC filing also reveals LTE support for AT&T, T-Mobile, Sprint, and HSPA+ bands plus GSM and CDMA, dual-band Wi-Fi, Bluetooth 4.0, NFC, Qi wireless charging. The battery, meanwhile, is supposedly getting a teeny boost, up to 2,300 from 2,100, according to those FCC logs. That slight increase is a little bit worrisome what with the 5's purported better screen, LTE support, faster chip, and whatnot. It's possible this phone could be quite the power hog, however, PhoneArena is claiming the 32GB model will come with a 3,000 mAh power pack. Update: Some images supposedly snapped with the Nexus 5 popped up on Google+ with EXIF data in tow, showing an 8MP camera that might be a little better than the Nexus 4. Most rumors are pointing to a launch at the end of the month, which marks about one year since the Nexus 4 reveal. Makes sense! There's nothing firm here from Google, but in light of all the information we already think we have on the Nexus 5, sooner rather than later is likely. Update: According to CNET, both the Nexus 5 and Android 4.4 Kit Kat will launch Tuesday, October 15. Probably in line with the old model, which means very competitive pricing. Last year Google kept things like LTE support off the table to keep the price down. Although the Nexus 5 will probably add 4G feature, it's only reportedly getting slight tweaks in other areas to help keep the phone on the cheaper end. We think it will likely be priced similarly to the Nexus 4, which cost $300 for the 8GB model and $350 for the 16GB off contract at launch, and got knocked down to $200 and $250, respectively, to help clear out inventory this past August. However it could be even more affordalbe. PhoneArena says the 16GB Nexus 5 will be $300 and a 32GB version with a 3,000 mAh battery will go for $400. Try, for a second, to get past Android 4.4's gross product placement with a literal candy bar (Google is, after all, an advertising company). The Nexus 5 will almost certainly come with the next of Google's candy-themed monikers—Kit Kat—out of the box. We've also seen rumblings of a redesigned dialer, and other small performance tweaks. And there's no evidence to support this per se, but it's likely Google would pull some of the best Android features—explained here—into Kit Kat. The Next Android Version Is Called... Kit Kat. Good God. Beyond that, this is purely speculation, but Kit Kat might make Active Notifications—the feature that lights up your phone any time you have a text or a Facebook message or something—a standard Android feature. It's already a great tool in both the Moto X and the new line of Droids, and it's available via app right now. More rumors will probably surface as we get closer to the launch of the Nexus 5, and we'll continue to update as information becomes available. From where we stand, it looks like a nice step forward on the Nexus project—a bargain phone with fewer compromises than ever.